My initial introduction to these type of songs was of course the dream sequence in Awara (more about that later). My father called it a 'double header' - the industry term for two separate songs that are picturised back-to-back, but which do not fit on one side of a 78 rpm record, so Song 1 would be on Side A while Song 1A would be on Side B. My next tryst with the same scenario was Megha re from Dil Deke Dekho. Then I watched Bobby and was caught by a similar sequence of songs. As I continued to watch Hindi films, I found that songs coming one immediately after the other was not as uncommon an occurrence as I'd initially thought. But that was as far as it remained - a thought filed away in some dark corner of my brain for no real purpose that I could fathom at the time. So when AK made this request of me somewhat-but-not-quite-in-jest, I sat down to make a list of songs that I remembered off-hand. Then, I had to do some digging. I also picked my husband's brains as AK (so helpfully) suggested. Not all the songs in this post are real 'double-headers', but they are all 'twin songs' - songs that are true back-to-back songs, songs that segue into each other with no dialogues or scenes in between. One of the finest dream sequences to be picturised in the annals of Hindi cinema, where Raj, the thief, the titular vagabond, fights a mental battle between going back to his former life, and his hopes and aspirations for a better one. Raj's conflict is picturised as his choice between heaven and hell - an allegory for his own conflict in real life. The sets were equally grandiose, with the steps climbing up to heaven, and the slippery slopes towards hell; a graceful Nargis promising redemption, and a giant KN Singh waiting for Raj to fall. As director, Raj Kapoor brought in Madame Simkie, Uday Shankar's dancing partner, to choreograph the song. There are two distinct songs in that track, but one follows the other with such fluidity that one can be forgiven for thinking they are one single song. While the original LP divided this entire song sequence into two segments as I mentioned earlier, the picturisation itself divided the sequence into three parts, symbolising Earth, Hell, and Heaven. So while Tere bina aag ye chandni symbolises Raj's plea to escape hell and his quest for music, love, life itself - Mujhko yeh narak na chahiye; mujhko phool, mujhko geet, mujhko preet chahiye, Mujhko chahiye bahaar [I don't want this hell; I want flowers, I want song, I want love, I want Spring], the gentler strains of Ghar aaya mera pardesi talks of the prodigal coming home to find that love, that music, that haven he so yearns for. The song took three months to shoot; this, after Raj Kapoor had rejected many tunes that Shankar-Jaikishen had composed. (There is a very interesting incident concerning the recording of this song. You can listen to one of the original musicians recount the anecdote, here. It is track number 4.1 on the list.) If you listen very carefully, you can hear the refrain of O basanti pavan paagal playing intermittently in the background - it's a tune that Raj Kapoor would use almost ten years later in Jis Desh Mein Ganga Behti Hai. *I have also seen Shailendra credited for both these songs. From one Kapoor to another. Shammi Kapoor had just burst into the limelight a couple of years ago with Tumsa Nahin Dekha opposite debutante Ameeta. Here, he (as Roop/Raja) reprises his earlier role opposite another fresh-faced debutante - Asha Parekh (as Nita). The situation runs thus - Nita is responsible for getting Raja thrown out of his job as a drummer in a local club. So when he runs into her again, he decides he wants revenge. Nita and her friends are on a picnic, and when Raja spots them, he plays Nita and one of her friends off against each other, tricking each into believing he is the other's fiancé. As expected, neither Raja nor Neeta can go for too long without squabbling. And they end up quarrelling over who is the better singer. Since the gauntlet has been thrown down, how can Raja not pick it up? So begins Megha re... which is followed by a duet with Nita beginning Bade hain dil ke kaale only to have Raja joining in. A lovely little satire about the provincialism that plagues the country, where people still refer to themselves as Punjabi or Gujarati, Maharashtrian or Marwari, Madrasi or Bengali, New Delhi sees Kishore Kumar as Anand, a Punjabi, who is forced to pretend to be a Tamilian in order to find accommodation. When he falls in love with Janaki (a Tamilian), he is forced by circumstances to keep the pretence going. But his parents make a surprise visit, and he finds himself in a mess. His sister advises him to at least confess the whole to Janaki. Anand agrees - before the whole thing blows up, he has to let his beloved know. He promises to tell her that evening - they are to participate in a stage show organised by Kala Mandir. Little does he know that all hell will break lose after the show. Mohan Sehgal, the writer-producer-director of this lovely film, and a product of Uday Shankar's dance academy, also choreographed this sequence, with one song moving fluidly into the next. Rosie (Waheeda Rehman) has left her husband Marcos (Kishore Sahu), and moved in with Raju Guide (Dev Anand), who fully supports her passion for dance. Raju not only encourages her to dance, but also manages her career. Eventually, Rosie's career flourishes, and she becomes the celebrated dancer, Nalini. Alas, on the way to that pinnacle, she and Raju drift apart. Rosy is resentful of the demands that Raju makes on her, and dance seems to be less of a joy than a duty to be performed. Raju is in no mood to relent - he is focused only on her triumph, and the lifestyle they live because of that. His gambling, drinking, and his coterie of hangers-on only drives Rosie further away from Raju. It is during this dark period that Marcos makes his presence felt again. First, he sends Rosie a copy of his newly-published book. Later, he decides to close their joint bank account and sends the bank manager to get Rosie's signature. Her jewels are in the locker, states the manager, and Marcos wants to ensure that Rosie gets them. Sure that Marcos is doing so to get Rosie back, and blinded by jealousy, Raju does not show Rosie the documents at all. Nor does he tell her about it. Instead, he forges Rosie's signature, laying the foundation for the destruction of all that he had worked so hard to build. Grief, hurt, anger, contempt, all war within her. And Raju, watching from the wings, is grieved himself. Only he knows that it was not greed but jealousy that caused him to stray so far beyond the pale. As he watches her dancing, it seems like he is trapped himself. So follows his plaintive Kya se kya ho gaya... What has he become for love of her? It is interesting to see the way these songs are picturised - Rosie's justifiable anger and hurt that sets off Raju's mental anguish that only we, the viewers, are privileged to watch. Like Tere bina aa gaye chandni and Ghar aaya mera pardesi, Raj Kapoor followed the double header format for this song in a film that brought teenage romance to the screen for the first time. The poor-little-rich-boy theme hadn't yet been explored to this extent before, and Rishi Kapoor, making his adult debut, made the most of the freshness of the theme and a debutante heroine who was barely into her teens. They exploded into national consciousness with a flourish that was unprecedented. Bobby, who is more than pleased to see Raja, and is listening to his promise, is not beyond teasing him a bit. Really? She queries. Is Raja sure that he will turn his back on wealth for the sake of his love? If he is lying, then Jhoot bole kauwa kaate... and then she will go back to her maternal home, and he will be left bereft. Her threats do not faze the young lad much, though. He is not one to buckle under threats, not even when they are from his beloved. That attitude will stand him in good stead as events unfold in ways that he could not have foreseen then. Based on Bankim Chandra Chattopadhyay's first novel, Durgesh Nandini was a tale of romance set against the background of the Mughal-Pathan conflicts during the time of Emperor Akbar. The love story of Tilottama (Bina Rai), the daughter of a feudal overlord, Raja Birendra Singh, and Jagat Singh (Pradeep Kumar), the son of Raja Man Singh, is fraught with troubles - their fathers are inimical to each other, even though both serve a common liege, Akbar. What is worse, when the Pathan, Katlu Khan (Ajit) attacks, he kills Tilottama's father, abducts Tilottama and her mother, and holds Jagat Singh captive. Their only hope is Ayesha (Nalni Jaywant), Katlu Khan's daughter who, though she has fallen in love with Jagat Singh herself, not only saves Tilottama from her father's lust, but also helps the lovers escape. This song comes before their capture - Tilottama and Jagat Singh are happily in love, and it is Holi. How can they not celebrate? Interestingly, in the first song, the two are alone, and Tilottama begs her beloved not to spray colour on her, using the analogy of Radha and Krishna. Just as she ends her song, the tempo of the music picks up and her attendants join her, singing Pyar ke rang mein saiyyan mori rang de chunariya. In a complete about turn, Tilottama joins in to ask that her beloved paints her with the colours of love, and Jagat Singh is more than pleased to acquiesce. Nagin was a film that went haywire in the last half an hour or so. (Not that it was great cinema the rest of the time.) For one, they had as many as five songs in that last section. In fact, if it weren't for a scene and a couple of dialogues in between, this would have been a triad of songs - Zindagi ke denewale comes less than a minute before these two songs begin. Secondly, the plot, which began as sort of Romeo-Juliet story set in the jungle, suddenly diverged into the heroine dying and being brought back to life by the power of love and prayer, but not before she passes a test of the strength of that love in Heaven (or Hell - the sets seemed to portray the latter, actually). Yes, it was that bad. But the songs, oh, the songs! Hemant Kumar unleashed a dozen tunes, each one of them a gem - though I do have my own favourites amongst them. As the song ends, the landscape also changes, into pits of fire and puffs of smoke, skulls and skeletons and weird animal-like beings who surround her as she dances to get away. And there is a Kathakali dancer who appears on a mountain... (No, don't ask!) You can watch the videos here, though Sun rasiya is missing its first verse - this video also has the beginning of the second song Mera badli mein chhup gaya, which can be watched here, but its second verse is missing, which is why I linked to the audio files instead. If it weren't for the fact that there was a three-sentence dialogue in between the song-sets, this would have been a continuation of the previous songs. As it is, the five songs come in the last half an hour of the film, making it possibly the largest combination of back-to-back songs, albeit with a break of a couple of scenes the first time, and three sentences of dialogue the next. Having successfully navigated the flames without being singed, Mala and Sanatan are happily united in that dream world. And so, of course, it is time for Mala to sing of her happiness, and thus begins Oonchi oonchi duniya ki deewarein. The sets now have lacy white clouds and winding staircases, peacocks and roses, statues and fireworks and accompanying dancers... and yes, she gets to change her costume once again. After all, anything is possible in a dream within a dream. And she comes back to life on Earth as well (finally! ), much to Sanatan's relief (and the viewers'!). You can watch the video of these two songs here; for some reason, Teri yaad mein is truncated, but Oonchi oonchi duniya ki deewarein is available in its entirety. The audio files have the full versions of both songs. Music director Madan Mohan seemed to specialise in composing wonderful songs for films that do not merit that score. Madhosh is a train-wreck in action, even with a young and scintillating Meena Kumari (at least in the first half), and the beautiful Usha Kiron. The problem is that the man at the apex of the love triangle is Manhar Desai. One really wonders at the women's taste in men, or lack thereof. Her dance is a prelude, almost a warm-up act for the main performance; no sooner than she ends her dance than Nazron ke chaar hote commences. The dancer is Raina (Usha Kiron), the daughter of a tribal chieftain, Shakriya (S Nazir), who is a sworn enemy of Raya's father. She seems to fall in love with Raya as soon as she set eyes on him though. In any case, she seems to be singing solely to, and for him. What I loved about these songs is the orchestration - the instrumental interlude between the songs is amazing. This is an interesting set of songs. Three back-to-back numbers, sung by the three heroines, who think the men they love have deserted them. Usually, directors choose to have one song, with each stanza being sung by the different heroines. Here we have three full-fledged songs instead. The three girls, Geeta (Ameeta), Rekha (Anita Guha) and Kalpana (Shubha Khote), have fallen in love with Ranjeet (Daljeet), an artist, Pradeep (Jawahar Kaul), a writer/publisher, and Mohan (Anoop Kumar), a singer. The men love their beloveds too. The problem, and of course there is one (or three), is that Geeta thinks Ranjeet is in fact Mohan, the singer; Rekha mistakes Pradeep for her artist tenant Ranjeet, and Kalpana thinks Mohan is Pradeep, the publisher. The stage is set for some wonderful hijinks as the men first try to set matters right, and when that fails, have to maintain the pretence of being someone they are not. When it all gets too much to bear, they run away (only for a bit, though), leaving their beloveds bereft. The film was a delightful watch, and Madan Mohan came up with a beautiful score that included, apart from the three songs mentioned above, Humse aaya na gaya, Kaun aaya mere man ke dwaare and Hum panchchi mastane. Based on the story of a young girl whom Dev Anand met in Nepal, Hare Rama Hare Krishna traced the story of two siblings separated from each other when their parents divorce. Prashant is brought to India by his mother, while Jasbir remains with her father; her nanny tells the young girl that her mother and brother are dead. In fact, her father, since remarried, even keeps Prashant's letters from boarding school away from his daughter. Finally, years later, Prashant (Dev Anand) gets a letter from his father saying that Jasbir (Zeenat Aman) has run away from home. When last heard from, she was in Nepal. Prashant decides to find his sister and bring her back into the family's fold. When he arrives in Khatmandu, his diligence rewards him with not Jasbir, but 'Janice'. She is living in a Hippy commune, and is addicted to both alcohol and drugs. She remembers nothing about her childhood or the brother she's presumed dead for these many years. Dum maaro dum became a cult hit when it released in the 70s. But interestingly, only one stanza was used in the film itself, as the sequence segues into the slightly preachy Dekho o deewano, sung by the brother, shocked to find his sister in such a place and such a state. In their award-winning book on RD Burman, The Man, The Music, authors Anirudha Bhattacharya and Balaji Vittal mention that Dum maaro dum was originally conceived as an Usha Uthup-Lata Mangeshkar duet. How it morphed into an Asha Bhosle solo is something no one knows. However, RD made it up to Usha Uthup by giving her another duet, I love you. Here is Dum maaro dum in full, audio version. Yaadon ki Baraat was a masala film where revenge and violence took centrestage. It also had a vast many sub-plots - a family torn apart by murder, brothers separated, the oldest seeking revenge for his parents' deaths, crime, brothers criss-crossing each other's paths without recognising their own blood, pretty heroines who provide a little romantic relief, and a 'family song' that eventually unites the three siblings. And oh, yes, a plethora of songs that became the film's USP. It helped that one of the brothers was a musician, setting the stage for several songs. Ratan (Tariq), the middle brother, has been saved (and brought up) by the boys' nanny. Now grown up, he is Monto, a singer who makes his living singing at a nightclub. Before he begins his performance, he sings the song that only two other people in the world - his brothers - know, in the hope that he will be reunited with them. That day, as the nightclub fills with youngsters celebrating the end of their college life, he begins the evening's programme with that song; unfortunately, his elder brother Shankar (Dharmendra), though present in the hotel, has not entered the restaurant. And his younger brother Vijay (Vijay Arora) is called away at just that moment. When Vijay comes back, he is thrilled to see Sunita (Zeenat Aman) with her friends there in the restaurant, and importunes her to sit with him at his table. She refuses. Watching this by-play, an amused Monto begins Aap ke kamre mein, and after the first verse, calls Sunita on stage to join him. Once Sunita is comfortable on stage, Monto invites Vijay on stage as well, and the youngest brother joins in for the last verse of Aap ke kamre mein. One musical interlude later, Monto segues into Dil mil gaye, with both Sunita and Vijay providing more than adequate support. They end with Dum maaro dum, a nod to the song's and Zeenat Aman's popularity. Perhaps it was the success of the medley in Yaadon ki Baraat that prompted Nasir Hussain to become even more ambitious when he launched his son Tariq as the parallel lead in Hum Kisise Kum Nahin (a longer and more important role than in Yaadon ki Baraat), with his own narrative arc. In The Man, The Music, there is mention of how Nasir Hussain had been to London where he was amazed to see teenagers dancing to one song after another without a pause. He wanted RD to replicate that in his film. RD's compositions, all four of them, had very different moods, melodies, and tone; yet, each one flowed seamlessly into the other. Here, the sequence is that of a dance competition between Sanjay (Tariq) and Manjeet (Rishi Kapoor) with Kaajal (Kaajal Kiron) joining in. Though still half in love with Sanjay, Kaajal is angry at being deceived (Sanjay had pretended to be Manjeet when they first met), and uses this opportunity to get even. The sequence begins with Manjeet already on the dance floor. He's beaten several other competitors already, and the present one trips over his own feet as Manjeet plays a furious trumpet solo. Then, as the competitor leaves dejected, you hear the soft strains of the guitar and Sanjay walks into the frame to take his place on stage - Chand mera dil begins in Mohammed Rafi's golden voice. Sanjay's assumption that she will have to return to him irks Kaajal, and she beams upon Manjeet in order to vex him. Sanjay's bolt is not shot yet. RD takes over from Rafi here. Red bandanna giving him a rakish look, Sanjay is confidence personified as RD Burman's guttural voice belts out Tum kya jaano, mohabbat kya hai. This was Tariq's moment in the sun. Manjeet is very appreciative and even encouraging of his competitor, but Kaajal cannot take any more of what she perceives as Sanjay's arrogance. When Sanjay is joined by a bevy of girls who provide back-up, an angry Kaajol makes her way to Manjeet's side of the dance floor with her friends, for the only duet in this medley - Mil gaya, hum ko saathi mil gaya. The medley ends with some serious instrumental music, as a hurt Sanjay, who watches Kaajal's marked preference for Manjeet, walks away from the competition, preferring to forfeit the fight. Dil leke daga denge comes at the very beginning of Naya Daur, and is interesting simply because the lyrics foreshadow the events that will come later. Shankar (Dilip Kumar) laughingly demands of Krishna (Ajit) - what can a fairweather friend offer him? And Shankar staunchly promises that he will show the world that he will shed his blood if need be. Words spoken in jest come to pass for both of them, and Krishna, at least, will, by the end of the film, have his bonds of friendship sorely (and bloodily) tested. But for now, the bonds are strong, and the two friends make their way back to their village after a hard day's work - to celebrate with the community. And so the strains of one song quietly segue into the enthusiasm of the next - Ye desh hain veer jawano ka is a rousing number bookended by a rollicking Bhangra beat, and replete with the nationalism and optimism that filled the hearts and minds of people at the time. While Mohammed Rafi sang for both Dilip Kumar and Ajit in the first song, and for part of the second, Balbir also lends his voice to Ajit in Ye desh hai veer jawano ka. So these are my selections. It's been a time-consuming task to discover which songs come back to back in films (other than the ones I knew of), and even more so to write them up. What made it all worthwhile is being able to listen to these songs while I was writing - it sweetened the task completely. I'm sure there must be many more such 'twin songs' - ones that I simply do not remember now, or ones that I'd never known were picturised back-to-back. Please feel free to add your own combinations to this theme. A well-researched, neatly thought out and nicely written piece. As always I am amazed by your knowledge of hindi cinema and hindi film music. Well done Anu. The idea of a post of 'twin songs' has crossed my mind now and then, but I've never actually thought of doing it because I could never think past Megha re bole/Bade hain dil ke kaale, Meri veena tum bin roye/etc and Mose chhal kiye jaaye/Kya se kya ho gaya! (Yes, I couldn't even remember that the songs from Awara, Nagin and Naya Daur were twin songs, though I've seen all three films). Well done, Anu! I'd never have been able to come up with so many good songs. Does this count as 'twin songs'? Na toh kaarvaan ki talaash hai and Yeh ishq ishq hai. I always regard it as two songs, because they have distinctive tunes (the segue is very good, though - very slickly done). (By the way, talking of Mose chhal kiye jaaye/Kya se kya ho gaya, my sister told me of a TV programme she was watching, hosted by Javed Akhtar, in which he mentioned that if you listen carefully, both songs actually have the sam tune, just played at different tempos). Kinda neat, I thought. Quite an impressive numbers the list has been able to present here. A goo deal of effort would have been invested, but the results make it well its worth. I had na toh kaarvaan ki talaash hai/ Ye ishq ishq hai on my list as two different songs. I always thought they were. As you said, there is a distinct difference in the tunes. But apparently it is one long qawali? The longest one, in fact, at more then 12 minutes. And I wasn't sure whether that was right or not, so I left it out. I'm thrilled you posted it here. Thank you, Ashokji. I'm glad you enjoyed the list. Thank you, Shilpi. The songs from Guide are wonderful, aren't they? 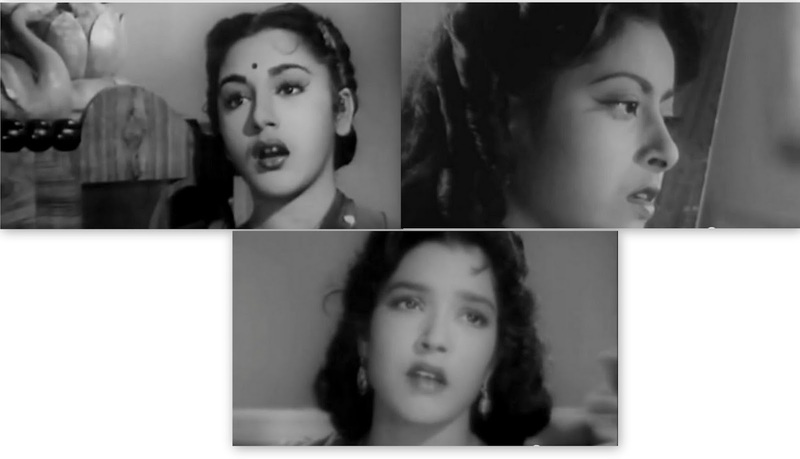 I particularly like Waheeda's expressions in Mohse chhal - the hurt and anger are so controlled, but so evident. I remember how we swung to the quartet from Ham Kisi se Kam Nahi. Loved the songs of Yadon Ki Baraat as well. Bobby was meri jaan. All the other oldies given here are such great songs. Somehow one song after the other never bored us. I just love long playing song sequences. They are what make our movies tick. Yes I just love her in that song. I can't thank you enough for this wonderful post. So well researched, such nice songs and so well-written. To use filmi-lingo, perfect execution of the supari I gave you. But seriously, thanks a lot from me, and my readers too who initiated discussion on the theme. You have also been very gracious in acknowledging us. One Two-in-one song I particularly like is the vintage Kaahe akela dolta baadal/Ek chhota sa mandir banaayenge by Surendra from Gramophone Singer (1938), music Anil Biswas. Unfortunately its video is not available, but the audio makes it clear it was two songs in different tunes that segue smoothly into one another. Thanks for the addition to the list. Perhaps some kind soul will upload the video sometime. This is a kind of overwhelming subject to take on, Anu! It's interesting to me that Hindi cinema felt so free (at least through the 90's) to set up back-to-back songs, expecting the audience to maintain interest. A *similar* use of songs is pretty easy to find in Hollywood stock musicals; you know, the more vaudevillian inspired fare (in which it wasn't necessarily used to transition from one emotional theme to another, but rather to show off different skills of the contracted stars) . . . But most of the songs you listed seem to be there to tell a story, not just soak up spare talent (with the exception of maybe Nagin's buffet of music). It's not meant to entertain like a cabaret show, but rather to tell the story sort of operatically, rather than verbally. Anyhow, my thoughts obviously aren't completely formed yet, but I do think this is a phenomenon that is unique in some way to Hindi cinema, and that alone makes your list pretty interesting. but he knew exactly whom to assign the task. Thukraye , a door mat song like Anpadh's Hai isis me pyaar ki aabroo? but I like them both, they are among the best of MM Lata combination. that he did it out of jealousy, will make me think twice. Once again well executed job. Thanks. Tu pyar kare ya thukraye is definitely a doormat song. :) A long time ago, I had threatened to do a post on doormat songs. Perhaps I will, after all. I'm so glad you enjoyed the post. Stellar collection as usual Anu. I'm so glad you picked some of the newer noteworthy songs as well. :) I really like the following couple of Marathi songs that suit your village theme. Thank you, Rashmi. I have seen the first film and so know the song, but Airanichya deva tula is new to me. Thank you for introducing me to the song. Simply fantastic. I never thought that there were so many back-to-back to songs. It was a pleasure to listen to all the songs. But the three songs (#10) from Dekh Kabira Roye (1957) were the best. Madanmohan has seamlessly merged the three songs into one and it is too good. Nonetheless the other songs were also good. Your write-up was as usual top class and I would say this would count among one of your best posts. Mr Venkatraman, Thank you for your kind words. So nice to see you here. And with songs that are absolutely new to me. It is interesting, isn't it, that they had back-to-back songs as early as that in our cinematic history? This film has definitely lingered in my thoughts since watching. I didn't love it, but I was moved by it. It says a lot of interesting things about adolescence, lost love, and realistic expectations for marriage . . . all of which you tackle above, of course. The film looks and feels dreamlike, like time has suspended just long enough for all three major characters to find some catharsis and move on with their lives. As much as the directorial craft is there, though, it's the liveliness of the leads and the beauty of the cinematography that make this memorable. I don't think I would have gotten through it without the force of the personalities behind the different characters. Konkona, for one, makes a very rough-around-the-edges, realistic teenager endearing. . . rather than whiny or grating. Ooh, what a great post on a "hatke" topic, Anu! I'm amazed at the number of back-to-back songs you came up with. The only inclusion that I question is "aap ke kamre mein" from Yaadon Ki Baraat." I really don't think it's two songs but rather one long, crazy [in a good way:-)] number. The Bhoot Bangla songs are back to back, as in, they do come one after the other - but there is a scene in between, so by my restrictions, they wouldn't count. But I so love Aao twist karein that I'm glad you posted them here. I'd never heard the Ram Rajya quartet before. As for Zamane ko Dikhana Hai, I'm only surprised that Nasir Hussain didn't ask RD for five songs.after the Hum Kisise Kam Nahin quartet. :) Thanks for posting these, Shalini, the only song I actually remembered from this film is Ae Kaanchi, hoga tumse pyara kaun. Well, I remember Poocho na yaar kya hua and Bolo bolo but completely forgot they were back to back songs. That film was another reworking of the Tumsa Nahin Dekha theme, no? I am reading this post a year late, but it's raining here in Trivandrum tonight and the blog seemed suitable. The rains take me back to my 3 years in Madikeri where it rained non-stop for 3 months at a time. I would walk to my office and back, wrapped up in a raincoat and holding an umbrella, perfectly happy, singing all my favourite rain songs to myself, quite loudly sometimes, because there was hardly anybody else on the road. "Kajra mohabbatwala, akhiyon mein aisa daala", one of my favourites. I was surprised not to find it in the collection because you rarely miss out on my favourites. In Chaudhvin ka Chand "Mera yaar bana hai dulha" gives way to "Balam se milan hoga". And that leads to another suggestion, a collection of wedding songs or bidaai songs? I can think of quite a few great ones.